Well it may not be getting much warmer, but the days are certainly getting longer. As I'm typing this, the sun is shining, the birds are singing, and I've got my Flopsy Girl by my side. 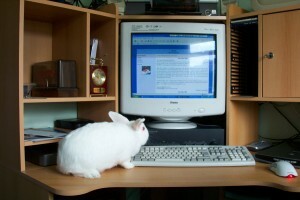 She is waiting for me to finish typing my journal so that she can start writing her first column for Bunny Camp News. I can't wait to read it!